Training for Season 2017 started in November, 2016 but now seems a good time to outline what my plan was at the offset, and how I’ve modified it as I go. 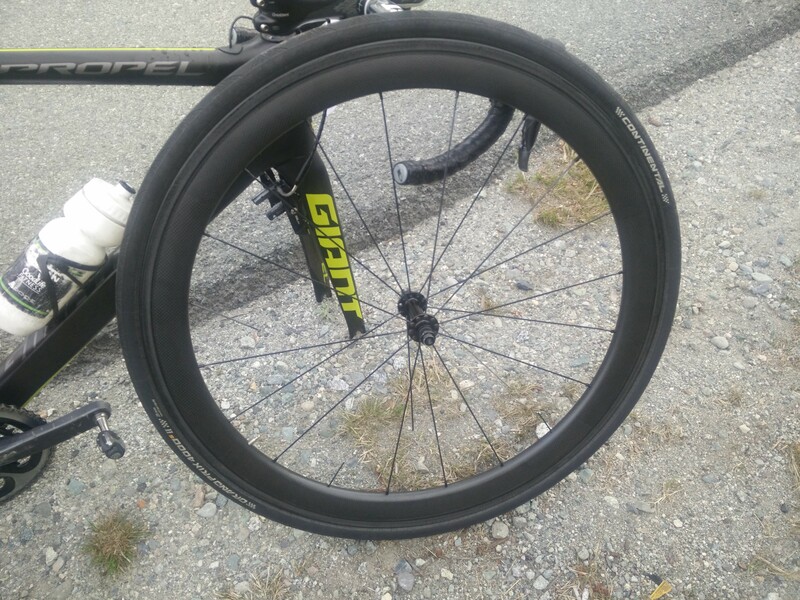 My transition out of Season 2016 began after a disappointing Whistler GranFondo race, where a local show-off passed me on the inside of a downhill curve… in a super-aero tuck… at nearly 70 km/h downhill… and took out half my front spokes and ended my day. Luckily I stayed up and rolled to a stop instead of hitting the pavement. I hitchhiked home and basically called it an end to my season. Enough said. 5 spokes down, but Chinese carbon rim & hub surprisingly damage-free! I basically threw up my feet after that for a while and just cruised a bit with no real specificity on the bike, exploiting the mild Autumn weather for some long Stamina rides. 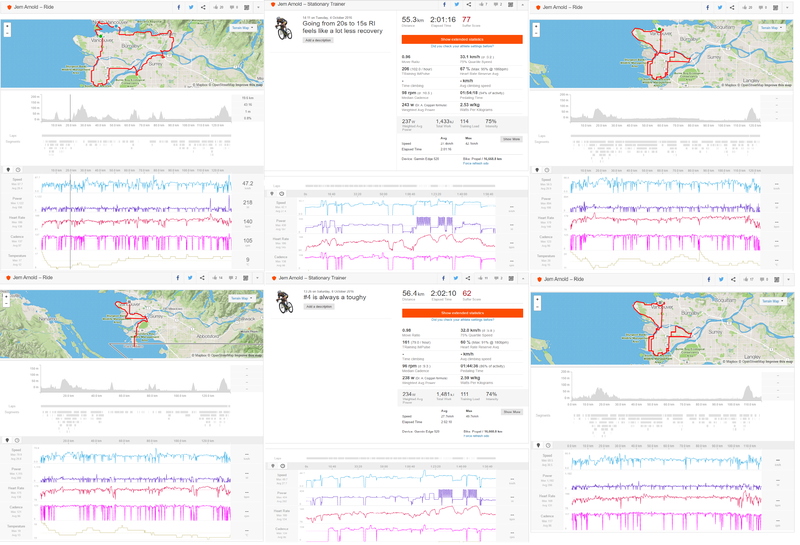 My CTL (Fitness) was at 97 on the day of the Whistler Fondo and I kept some of that fitness through to October. I had a trip to Japan coming up in the middle of October and an extra week off work before I went away. I didn’t want to see my CTL drop off the chart and the weather cooperated so I decided to put myself through a bit of an end-of-season training camp. What I called Stamina Week. Stamina Rides are what I call 4+ hr, ~3000 kJ steady Zone 2 rides. Basically the aim is to extend the Power Duration Curve with as little fall-off as possible beyond 1-hour. Stamina Week was 22 hrs of this kind of steady Zone 2 riding outside, and VO2max intervals on the Kickr indoors. It bumped my fitness back up from a CTL of 80 to 94, although I was pretty fatigued by the end of the week. I hoped this pure aerobic fitness boost would persist the two weeks off the bike in Japan. I think it did and I’ll discuss what I think the physiological adaptations were in the future. Goal-setting will have to be another future discussion, but I’m targeting two major peaks for the 2017 season. The first in May and again in mid July, then Fondo Season in August as a minor end-of-season peak. The plan is constantly changing – in fact, it’s changed in the few days since I took this screenshot, but it’ll likely change again so as a rough visual guide this is sufficient. 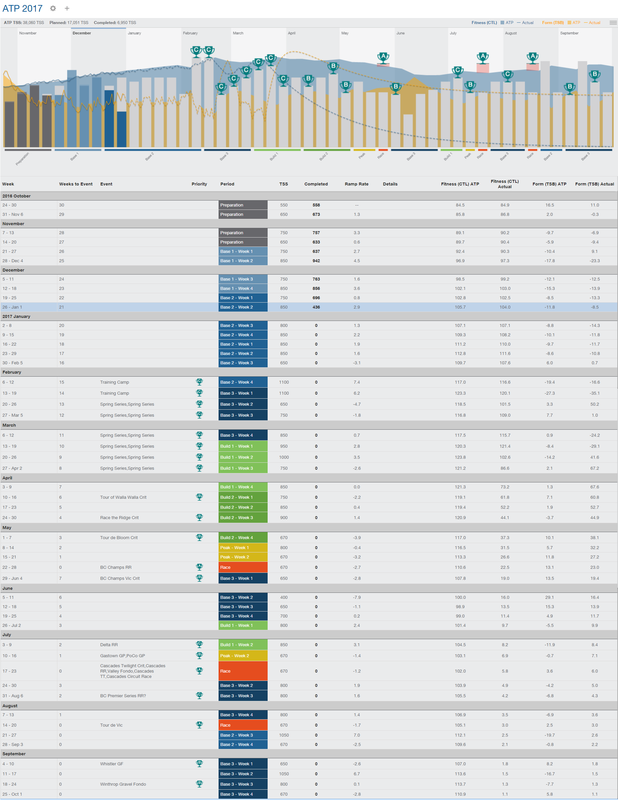 The TSS (training load) numbers look huge, but again they’re only general guidelines for now. And I’ll be accomplishing most of the training load as low intensity, high volume Zone 2, with some VO2max drills similar to what I did during Stamina Week 2016. This Polarized approach should accumulate the training load without running down my body during the sustained Base weeks. Next time I’ll talk more detail about how I’ve planned and executed my Polarized Base training based on synthesizing training methodology & my particular physiology & goals.